Every new Azure AD tenant comes with an initial domain name, domainname.onmicrosoft.com. You can't change or delete the initial domain name, but you can add your organization's names to the list. Adding custom domain names helps you to create user names that are familiar to your users, such as alain@contoso.com. Before you can add a custom domain name, you must create your domain name with a domain registrar. For an accredited domain registrar, see ICANN-Accredited Registrars. 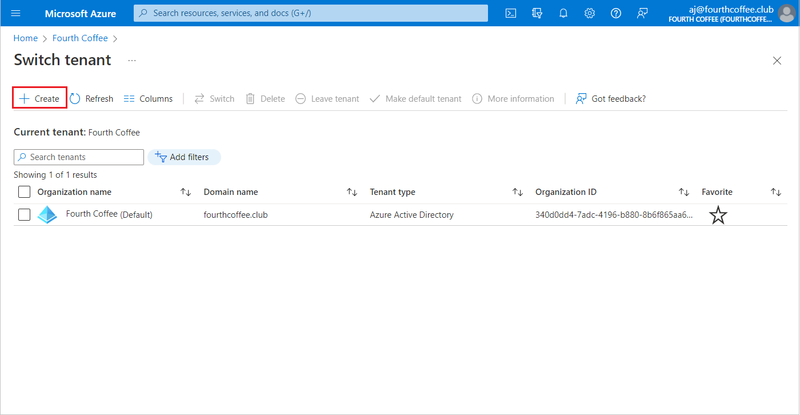 After you get your domain name, you can create your first Azure AD directory. Sign in to the Azure portal for your directory, using an account with the Owner role for the subscription, and then select Azure Active Directory. For more information about subscription roles, see Classic subscription administrator roles, Azure RBAC roles, and Azure AD administrator roles. If you plan to federate your on-premises Windows Server AD with Azure AD, then you need to select the I plan to configure this domain for single sign-on with my local Active Directory checkbox when you run the Azure AD Connect tool to synchronize your directories. 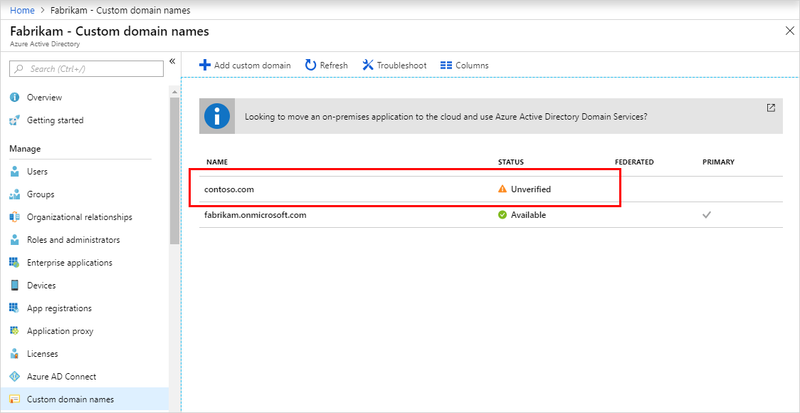 You also need to register the same domain name you select for federating with your on-premises directory in the Azure AD Domain step in the wizard. You can see what that step in the wizard looks like in these instructions. If you do not have the Azure AD Connect tool, you can download it here. Create your new directory by following the steps in Create a new tenant for your organization. The person who creates the tenant is automatically the Global administrator for that tenant. The Global administrator can add additional administrators to the tenant. After you create your directory, you can add your custom domain name. Select Custom domain names, and then select Add custom domain. Type your organization's new domain name into the Custom domain name box (for example, contoso.com), and then select Add domain. The unverified domain is added and the Contoso page appears showing you your DNS info. You must include .com, .net, or any other top-level extension for this to work properly. Copy the DNS info from the Contoso page. For example, MS=ms64983159. 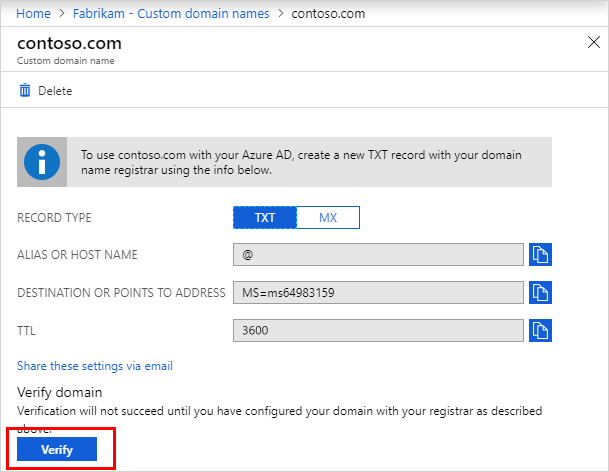 After you add your custom domain name to Azure AD, you must return to your domain registrar and add the Azure AD DNS information from your copied TXT file. Creating this TXT record for your domain "verifies" ownership of your domain name. Go back to your domain registrar, create a new TXT record for your domain based on your copied DNS information, set the TTL (time to live) to 3600 seconds (60 minutes), and then save the information. You can register as many domain names as you want. However, each domain gets its own TXT record from Azure AD. Be careful when entering your TXT file information at the domain registrar. If you enter the wrong, or duplicate information by mistake, you'll have to wait until the TTL times out (60 minutes) before you can try again. 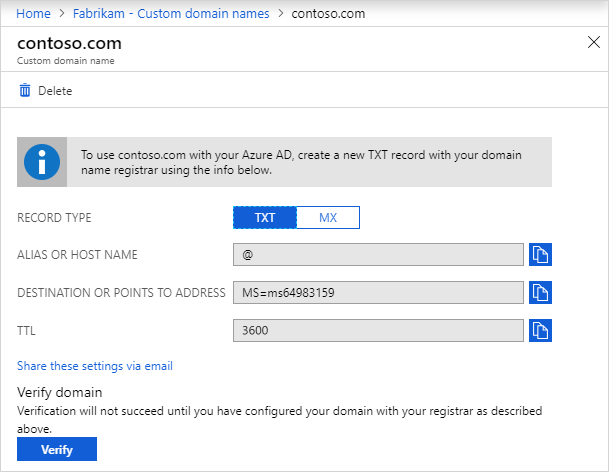 After you register your custom domain name, you need to make sure it's valid in Azure AD. The propagation from your domain registrar to Azure AD can be instantaneous or it can take up to a few days, depending on your domain registrar. On the Contoso page, select Verify to make sure your custom domain is properly registered and is valid for Azure AD. After you've verified your custom domain name, you can delete your verification TXT or MX file. Wait at least an hour and try again. DNS records must propagate before Azure AD can verify the domain and this process can take an hour or more. Make sure the DNS record is correct. 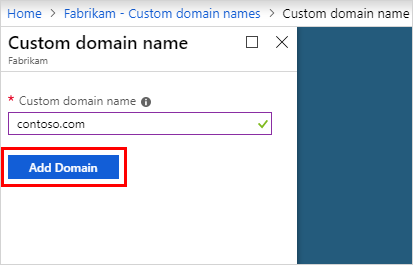 Go back to the domain name registrar site and make sure the entry is there, and that it matches the DNS entry information provided by Azure AD. If you can't update the record on the registrar site, you must share the entry with someone that has the right permissions to add the entry and verify it's accurate. Make sure the domain name isn't already in use in another directory. A domain name can only be verified in one directory, which means that if your domain name is currently verified in another directory, it can't also be verified in the new directory. To fix this duplication problem, you must delete the domain name from the old directory. For more information about deleting domain names, see Manage custom domain names. Make sure you don't have any unmanaged Power BI tenants. If your users have activated Power BI through self-service sign-up and created an unmanaged tenant for your organization, you must take over management as an internal or external admin, using PowerShell. To learn more about how to take over an unmanaged directory, see Take over an unmanaged directory as administrator in Azure Active Directory. Add another Global administrator to your directory. For more information, see How to assign roles and administrators. Add users to your domain, see How to add or delete users. 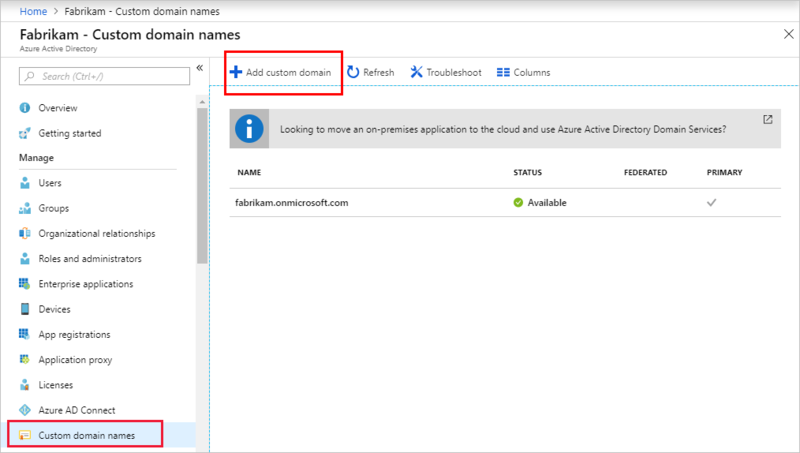 Manage your domain name information in Azure AD. For more information, see Managing custom domain names. If you have on-premises versions of Windows Server that you want to use alongside Azure Active Directory, see Integrate your on-premises directories with Azure Active Directory.